We’re all protected, aren’t we? We are ‘not protected against natural events’ that we have ‘no control over’, but governments have been doing their best to monitor activities, which is one ( 1 ) reason ‘why’ the United States Air Force ( USAF ) ‘subordinate organization’ known as its Air Force Weather Agency ( AFWA ) analyzes significant scientific data from horizons above and below the Earth, searching for clues as to what ‘natural significant event’ ( i.e. Solar Energetic Particle Event ( SEPE ), tectonic plate shift ( continental earthquakes ), magnetic pole shift ( climate change ), or something else as dramatic will occur. The sole “Mission” of the U.S. Air Force Weather Agency ( USAFWA ) is tasked as the only U.S. government Agency ‘officially designated to analyze’ incredible amounts of scientific doom and gloom information the public might think came from ‘doomsday prophets’ concerned about Earth calamities going to happen soon. Current official information ( received 24-hours a day and 365-days a year ) by the U.S. Air Force Weather Agency ( USAFWA ) and its host Directorate of Operational Weather Squadrons ( OWS ), group of ‘solar observatories’, ‘satellites’, ‘spacecraft’, ‘interstellar lightwave spectral and radio-frequency ( RF ) imaging sensors’, ‘telescopes’ with a wide array of ‘cameras’ as well as ‘human observers’ are continuing to report enough worrisome information that would scare many of us, but – ‘officially’ – the public will never know ‘what’ is about to befall them or ‘when’ that will occur. After a considerable amount of research into this subject, the U.S. Air Force was caught ‘publicly admitting’ they are able to “know within minutes” as to ‘what significant Earth Event is coming’ and just ‘when it will arrive’ – anywhere between a few hours up-to days in-advance’, but the public will never be informed. Why? Doom & Gloom or Fantasy Island? Undoubtedly, classified ( in the ‘interest of national security’ ), would be the officially given reason to the public. Some might ask, “But, for ‘whose’ “security?” People, for the most part, are ‘not secure’ – especially when facing a pending injurious consequence resulting in ruination of life as they may have come to know their’s – and most gravitate toward wanting to “be with family” ( or “loved ones” ) as any pending cataclysmic Earth Event draws nearer to them all. The U.S. Air Force Weather Agency ( AFWA ), however realizes that being occupants of planet Earth is ‘not the same thing as’ “Fantasy Island” or a trip to “McDonaldland” as the rest of the public at-large has come to know ‘their version’ of what planet Earth is for ‘them’ and their children. What may even be more interesting to the public is to review official U.S. data surrounding what U.S. Air Force commands ‘are already preparing for’, what ‘they already have set in-place’ for ‘everyone living in the Continental United States ( CONUS )’, and ‘how they are going to accomplish’ their secret-sensitive “Mission” on ‘people’ throughout the United States. This is ‘definitely not’ a ‘science fiction movie’ or ‘Orwellian Theory’ within this report, but strictly what the U.S. Air Force Weather Agency and another U.S. Air Force ‘subordinate organization’, the Air and Space Operations ( ASO ), Director of Weather ( USAF Deputy Chief of Staff ) has ‘recently laid-out publicly’, but for the ‘public’ to decipher ‘all of what was so officially presented’ many were lost in the government psychobabble resulting in no impact on the public as to the ‘seriousness’ for what they need to ‘begin preparing for’. Television Commercial ‘Official Advertisement’ Already Warned Public! FEMA’s TV commercial advertisement ( see video clip – below ) is easily recalled by those who watch / watched it – depicting a ‘family inside a home’ where all of a sudden everything inside the home’ begins floating up in the air; as though ‘gravity was somehow suddeny lost’. This ‘professionally produced television commercial advertisement’ from FEMA ‘stylishly warns people to prepare for any unexpected natural disaster Earth Event, however FEMA did not describe ‘what type of event strike for people to expect’. The sadest part about this is that the U.S. government actually considers this television commercial advertisement an “official public warning to prepare for a national disaster” while simultaneously the U.S. government hopes the commercial will ‘not’ create ‘panic’ or ‘chaos’ in the streets that would disrupt ‘skyrocketing profits’ received by ‘global elite’ and/or ‘big business’ through their stock market portfolios. In short, this alluding to a national disaster is nothing short of being the ‘Biggest Show On Earth’ continuing profits from basic living expenses saddling the ‘little people’, ‘worthless eaters’, and ‘consumers of “blue gold” ( water ) the global elite predict will rise – more-so than precious metals – after such an Earth Disaster Event ( EDE ). One of the most worrisome concerns, after reviewing this report ( filled with official U.S. government information’ ), is: ‘What’, ‘when’ and ‘how’ U.S. government ‘decision-makers’ react to their ‘official alert’. Many will undoubtedly and instantly gather with ‘their families’, however ‘what about the rest of us’ gathering with ‘our families? We will not be provided the same ‘early alert’ to even know – until after it ( significant Earth Event ) already takes place! Is this ‘fair’? Is this ‘just’? Is this ‘humane’? Or, is this pure and unadulterated ‘elitist selfishness’ that government affords for only a ‘select few’ lucky souls fortunate enough to be provided with sufficient warning in-advance and additionally told were to go and what to do in order to escape the wrath of such a cataclysmic Earth Event? Few people realize that those ‘decision-makers’ have already been instructed in-advance as to ‘what’ they need to do and ‘when’ they need to do it. This report contains ‘no old news’ but ‘new official U.S. government revelations’, which cause the public to re-think where they are and what is coming. The only information this report does ‘not’ provide publicly are the ‘names’, ‘addresses, ‘phone numbers’, and ‘photographs’ of those ‘key individuals’ whom are ‘already designated’ as those ‘ready’, ‘willing’ and ‘able’ to ‘perform as ordered on-command’ – even if that command is ‘unable to be given’ after a cataclysmic Earth Event! There are only two ( 2 ) ‘official U.S. government reports’ provided ( below ) in this report, which contains internet links to more ‘official information’ on this subject. Knowing the public at-large, and hot it predominantly enjoys ‘entertaining flowery written articles’ – they never bother to ‘research’ anything further about’ – this report was purposely kept ‘short and sweet’ ( no flowers – no frills ). It includes an ‘official government article’ that was converted into a ‘very simple outline’, and that is followed-up with yet another ‘official government article’ left as-is. Hopefully, some may consume this report far-easier than others at this website so its point on this subject may be even-better publicly received. The first ( 1st ) report ( included immediately below ) was ‘thoroughly analyzed’ in its ‘original format’, and then – based on ‘even more detailed official information’ discovered – was ‘re-formatted into an even-more proper perspective’, and – for the sake of making this report far-more easily comprehendible for public review – it was finally ‘converted into a simple outline format’ but only because of the fashion by-which government complicated the original public information release’; saying everything but not saying it very well for the public to easily understand. The second ( 2nd ) report ( further below ) was left in its ‘original format’ because anyone reviewing it can quickly understand the nature of the ‘true problems’ surrounding what we all are going to be facing soon enough. You be the judge, as to ‘what’ you will do, to ‘prepare’ for the ‘officially expected’ Earth Event. Enjoy the report ( below ) and be sure to click on the embedded links to learn more about ‘what effects’ are ‘coming’ and ‘what’ the U.S. Department of Homeland Security ( DHS ) is preparing for. Tell a friend about what you review ( below ) and your reply may be, “You can’t trust what you read on the internet.” If anyone does ‘not trust’ this report ( below ) – or anything else on this website – they should click on the ‘official government website links’ ( provided at the bottom of this report, and other links found herein ) – if they are equipped with an ‘attention-span’ ( longer than a bug ) or ‘not easily distracted’ by something as simple as a ‘horn honk’ – then they can ‘research it all’ for themselves and try to prove this information and you are incorrect. Many will be amazed at how much these official government revelations will help them to prepare for more than ‘entertainment’. 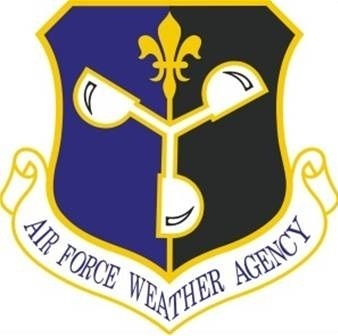 United States Air Force Weather Agency ( USAFWA ) – aka – Air Force Weather Agency ( AFWA ) claims heritage extrapolated back to World War I, when the U.S. Army ( USA ) ‘subordinate organization’ Signal Corps ( ASC ) ‘subordinate organization’ “Meteorological Service” ( SCMC ) provided ‘weather support’ for U.S. Army defense aircraft pilots. Amidst the legacy of the U.S. Secretary of War, ( known ‘today’ as ) U.S. Department of Defense ( DoD ), it – having realized its ‘subordinate organization’ U.S. Army had ‘increasing military personnel numbers’ due to an ‘increasing defense stockpile inventory’ of U.S. Army ‘militarized aircraft’ – created a ‘then-new subordinate organization’ known as the U.S. Army ( USA ) Air Corps ( AAC ) that became well-known as the U.S. Army Air Corps ( USAAC ). On July 1, 1937 the U.S. Secretary of War ‘reorganized’ the U.S. Army ‘subordinate organization’ Signal Corps ( ASC ) ‘subordinate organization’ Metereological Service ( MS ) ‘out-of’ the Signal Corps ( SC ) and ‘in-to’ the U.S. Army ( USA ) ‘subordinate organization’ Air Corps ( ASC ) as its ‘then-new subordinate organization’ Meteorological Service ( ACMS ). On April 14, 1943 the U.S. Army Air Corps ( USAAC ) ‘subordinate organization’ Meteorological Service ( MS ) was ‘renamed’ “Weather Wing” ( WW ) and ‘physically moved’ to an Asheville, North Carolina location – where ‘today’ the U.S. Air Force Weather Agency ( USAFWA ) has its 14th Operational Weather Squadron ( OWS ) located. In 1945, the U.S. Army Air Corps ( USAAC ) Weather Wing ( ACWW ) was ‘renamed’ the U.S. Army Air Corps “Weather Service” ( ACWS ). In early 1946, the U.S. Army Air Corps Weather Service ( ACWS ) was ‘physically moved’ from Asheville, North Carolina to the U.S. Army Air Corps Langley Field Station – where ‘today’ Langley Air Force Base ( LAFB ) is located. On March 13, 1946 the U.S. Army Air Corps Weather Service ( ACWS ) was ‘reorganized’ under the U.S. Army Air Corps ( USAAC ) ‘new subordinate organization’ Air Transport Command ( ATC ) where its ‘then-new subordinate organization’ “Weather Service” ( ACWS ) was ‘renamed’ “Air Weather Service” ( AWS ). Later-on, in 1946, the U.S. Army Air Corps ( USAAC ) Air Transport Command ( ATC ) Air Weather Service ( AWS ) was ‘physically moved’ to Gravelly Point, Virginia. In 1947, the U.S. Army Air Corps ( USAAC ) was ‘renamed’ United States Air Force ( USAF ) whereupon the “Air Weather Service” ( AWS ) became ‘directly under it’ and assumed ‘sole responsibility’ over ‘all global weather reporting’ and ‘all global weather forecasting’ for ‘both’ the U.S. Air Force and U.S. Army. In 1948, the USAF ‘newly activated’ Military Air Transport Service ( MATS ) – ( known ‘today’ as ) Military Airlift Command ( MAC ) – then-received its ‘newly-transferred subordinate organization’ Air Weather Service ( AWS ) that was ‘removed from being directly under’ USAF ‘headquarters’. USAF Military Air Transport Service ( MATS ) ‘subordinate organization’ Air Weather Service ( AWS ) was then ‘physically moved’ to Andrews Air Force Base ( AAFB ) in Maryland. In 1958, the USAF Military Airlift Command ( MAC ) ‘subordinate organization’ Air Weather Service ( AWS ) was then ‘physically moved’ to Scott Air Force Base ( SAFB ) in Illinois where – for almost 40-years – it remained. In 1991, the USAF Military Airlift Command ( MAC ) ‘subordinate organization’ Air Weather Service ( AWS ) was ‘redesignated’ as a “field operating agency” and then ‘reorganized’ directly back under USAF ‘headquarters’. On October 15, 1997 the USAF Air Weather Service ( AWS ) was ‘redesignated’ as the “Air Force Weather Agency” ( AFWA ) and ‘physically moved’ to Offutt Air Force Base ( OAFB ) in Nebraska where it remains ‘today’ – at least for the moment. $183,000,000 million U.S. dollars ( annually ) includes $98,000,000 million dollars for ‘Operations’ and ‘Maintenance’. Offutt Air Force Base ( OAFB ) in Nebraska ( USA ). USAF Air and Space Operations ( ASO ), Director of Weather ( DOW ), Deputy Chief of Staff ( DCS ). – Land; – Air; – Space; and, – Internet ( cyberspace ). – Military ( active-duty and reserve ); – Contractors ( government contracts ); and, – Civilians. – ? ( # ) Agencies ( staff ); – Two ( 2 ) Weather Groups ( WXG – Coordinators ); – Fourteen + ( 14 + ) Weather Squadrons ( OWS – Directorates ); – Five ( 5 ) Observatories ( solar ); and, – One ( 1 ) Strategic Operation Systems Center ( Unknown – ‘subordinate organization’ ). Global Environmental Intelligence ( GEI ) data is ‘collected’ from a variety of ‘information monitoring sources’ ( Earth based and space based locations ) providing a variety of ‘data feed streams’ of information from a computer operated system network out-of a ‘Strategic Center’ processing indications detecting almost any ‘significant natural negative impact’ that ‘could occur’ on ‘people’ and ‘national infractures’ throughout ‘global geographic regions’ and in ‘outerspace’. – Ground Sensors ( infra-red, spectral and sonic );; – Submerged Sensors ( infra-red, spectral and sonic );; – Space-based Sensors ( lightwave, spectral and sonic ); – Long-Range Telescopes ( radio-frequency wave, optical lightwave and sonic ); – Imaging Cameras ( lightwave, spectral and sonic ); and, – Human Observers ( various means ). The U.S. Air Force ( USAF ) Air and Space Operations ( ASO ) Communications Directorate ( ” A6 ” ) ‘provides’ the ‘policy oversight’ and ‘planning oversight’ of Command, Control, and Communication Intelligence ( C3I ) for the U.S. Air Force Weather Agency ( USAFWA ). USAF Air and Space Operations ( ASO ) Communications Directorate ( A6 ) also ‘provides support’ over ‘daily operations’, ‘contingency actions’, and ‘general’ Command, Control, Communication and Computer Intelligence ( C4I ) for the U.S. Air Force Weather Agency ( USAFWA ). – Global Environmental Intelligence ( GEI ) – Operational Weather Squadrons ( OWS ). A ‘minimum’ of fourteen ( 14 ) Operational Weather Squadrons ( OWS ) are on-station ( active ) 24 hours per day 7 days per week 365 weeks per year to mitigate ( handle ) Global Environmental Intelligence ( GEI ) issues. – ‘Process’ Global Environmental Intelligence ( GEI ) data; and, – ‘Provisionally Distribute’ Global Environmental Intelligence ( GEI ) data. – 2nd ( Strategic Computing Network Center ) Systems Operations Squadron ( SOS ) – Offutt Air Force Base, Nebraska; – 2nd Operational Weather Squadron ( OWS ) – Offutt Air Force Base, Nebraska; and, – 14th Operational Weather Squadron ( OWS ) – Asheville, North Carolina. – U.S. Agency ‘decision-makers’; – U.S. Department of Defense ( DoD ) ‘decision-makers’; – U.S. Allied Foreign Nation ‘decision-makers’; and, – U.S. Joint Operations ‘Warfighters’. USAF Air and Space Operations ( ASO ) Plans and Requirements Directorate ( PRD ) – also known as – ( ” A3 ” and ” A5 ” ) ‘develops’ and ‘maintains’ the ‘concepts of operations’ for how U.S. Air Force Weather Agency ( USAFWA ) – also known as – Air Force Weather ( AFW ) supports “most weather sensitive” areas of ‘joint capabilities’. – Timely; – Relevant; and, – Specialized. Det. 1 ( 2ND WXG SO Detachment 1 – Learmonth, Australia ); Det. 2 ( 2ND WXG SO Detachment 2 – Sagamore Hill, Massachusetts ); Det. 4 ( 2ND WXG SO Detachment 3 – Holloman Air Force Base – New Mexico ); and, Det. 5 ( 2ND WXG SO Detachment 4 – Palehua, Hawaii ). USAF Air and Space Operations ( ASO ) Plans and Requirements Directorate ( PRD ) – also known as – ( ” A3 ” and ” A5 ” ) ‘works in conjunction with’ MAJCOM ‘functional counterpart users’ of products, data and services supplied from U.S. Air Force Weather Agency ( USAFWA ) – also known as – Air Force Weather ( AFW ). USAF Air and Space Operations ( ASO ) Plans and Requirements Directorate ( PRD ) – also known as – ( ” A3 ” and ” A5 ” ) is ‘one ( 1 ) agent’ of the ‘lead Command’ for ‘gathering operational requirements’. – Planning – Military Operation Missions ( global spectrum ); and, – Executing – Military Operation Missions ( global spectrum ). USAF Air and Space Operations ( ASO ) Plans and Requirements Directorate ( PRD ) – also known as – ( ” A3 ” and ” A5 ” ) ‘coordinates’ U.S. Air Force Weather Agency ( USAFWA ) – also known as – Air Force Weather ( AFW ) policy issues. – Warnings ( 24-hours / 7-days a week / 365-weeks a year ); – Military Mission Briefings ( 24-hours / 7-days a week / 365-weeks a year ) – Forecasts ( 24-hours / 7-days a week / 365-weeks a year ); and, – Analysis ( 24-hours / 7-days a week / 365-weeks a year ). – Computer System Complex; – Computer System Network Productions; – Computer System Applications; – Computer System Operations; – Computer System Sustainment; and, – Computer System Maintenance. Air Force Weather Enterprise ( AFWE ) is a ‘computer system’ of the U.S. Department of Defense (DoD ). AFWE computer system access is ‘restricted’ to members of the United States military ( Active Duty, National Guard, or Reserve Forces), U.S. Government, or U.S. government contractors that do business with the U.S. government and require ‘weather information’. The U.S. Air Force ( USAF ) Air and Space Operations ( ASO ) Strategic Plans and Programs Directorate ( ” A8 ” ) ‘directs’ the ‘planning’, ‘programming’, ‘budgeting’, ‘development’, ‘acquisition’, ‘engineering’, ‘configuration management’, ‘modification’, ‘installation’, ‘integration’, ‘logistics’ and ‘life cycle maintenance support’ over ‘all’ of the ‘computer processing equipment’ and over ‘all’ of the ‘standard weather systems’. The USAF Air Force Weather Agency ( AFWA ) 1st Weather Group ( 1ST WXG ) Directorate uses ‘four’ ( 4 ) Operational Weather Squadrons ( OWS ) ready 24-hours a day 7-days a week 365-days a year to provide its Global Environmental Intelligence ( GEI ) notification distributions to U.S. ‘military forces’ ( see military branches below ) at 350 ‘specific installations’ located in ‘five’ ( 5 ) Continental United States ( CONUS ) Regions. – U.S. Air Force; – U.S. Air Force Reserve; – U.S. Air Force National Guard; – U.S. Army; – U.S. Army Reserve; and, – U.S. Army National Guard. USAF Air and Space Operations ( ASO ) Plans and Requirements Directorate ( PRD ) – also known as – ( ” A3 ” and ” A5 ” ) ‘works with’ USAF Air and Space Operations ( ASO ) staff to integrate U.S. Air Force Weather Agency ( USAFWA ) – also known as – Air Force Weather ( AFW ) Continental Operations ( CONOPS ) with U.S. Air Force ‘plans’ and ‘Programs’. USAF Air and Space Operations ( ASO ) Plans and Requirements Directorate ( PRD ) – also known as – ( ” A3 ” and ” A5 ” ) ‘assists’ in the ‘exploitation of weather information’ for ‘warfighting operations’. – USAF Weather Agency officer ‘upgrade’ training; and, – Apprentice forecaster ‘initial’ qualification. – Manpower; – Organization; – Personnel; and, – Training. USAF Air and Space Operations ( ASO ) Plans and Requirements Directorate ( PRD ) – also known as – ( ” A3 ” and ” A5 ” ) ‘oversees’ and ‘executes’ U.S. Air Force Weather Agency ( USAFWA ) – also known as – Air Force Weather ( AFW ) Standardization and Evaluation Program for ‘Weather Operations’. U.S. Air Force ( USAF ) Air and Space Operations ( ASO ) Plans and Requirements Directorate ( PRD ) – also known as – ( ” A3 ” and ” A5 ” ) ‘assists’ the USAF Air and Space Operations ( ASO ) staff with managing U.S. Air Force Weather Agency ( USAFWA ) – also known as – Air Force Weather ( AFW ) the ‘process’ of ‘career field-training’ by ‘obtaining training’ and ‘implementing training’ to meet ‘career field-training requirements’. U.S. Special Forces; U.S. Joint Operations; U.S. Combined Operations; U.S. Air Force; and, U.S. Army. NEBRASKA, Offutt Air Force Base – February 25, 2011 – Solar Maximum may sound like the name of a super hero, but it’s certainly no comic book or 3-D movie. Solar Maximum is actually the name for the Sun’s most active period in the solar cycle, consistently producing solar emissions, solar flares and sun spots. For a little background on the sun’s activities, the star goes through roughly 11-year cycles of where it is very active and also relatively calm. The Sun’s last Solar Maximum occurred in 2000 and it is expected to awaken from its current solar minimum and get more active this year. That is why the squadron’s worldwide space weather team of roughly 50 active-duty members, civilians and contractors continually analyze, forecast and provide alert notifications for the entire U.S. Department of Defense ( DoD ), as well as a slew of other government agencies. “When ‘space weather’ causes impacts to earth that meet or exceed warning thresholds our end users are informed within minutes,” said Staff Sgt. Jonathan Lash, space weather flight forecaster. We send out warning bulletins through a computerized distribution system, [ and ] we have other graphical products that show what happened in the past 6-hours around the globe as well as what we expect to happen in the upcoming 6-hours,” he said. Members of the 2nd Weather Squadron [ OWS ] rely on five ( 5 ) ground-based Solar Observatories, as well as a network of satellites orbiting the earth, to accomplish their mission. – Australia; – Hawaii; – Italy; – Massachusetts; and, – New Mexico. They include both optical telescopes and radio telescopes and ensure the Weather Squadron always has one eye, or ear, on the sun. Through filtered lenses space weather analysts are able to perform flare patrol and view sunspots to determine the magnetic complexity of the region. But not all of the sun’s activities can be captured using optical telescopes. Some events have a unique radio-frequency signature that can also be measured. Using a mixture of technology from the 1970s to the present day, radio observatories are able to monitor frequencies in the 25 MhZ to 180 megahertz range, as well as eight ( 8 ) other discrete frequencies. Their digitized output is collected by a computer and then processed and analyzed for solar activity. “We actually are able to detect the specific strength at a given radio frequency,” said Major Bradley Harbaugh, who commands the Detachment 5 solar observatory for the 2nd Weather Squadron [ OWS ] at Palehua, Hawaii. What we detect are energetic solar emissions in [ specific ] frequency bands or ranges. When detected, we [ are able to describe ] the start time, duration, intensity and type of solar emission. This helps describe the potential impacts by identifying the characteristics of what may impact earth,” he said. Identifying these solar emissions is crucial to warfighter communication abilities. The Weather Squadron network of satellites includes those owned and operated by the U.S. Department of Defense ( DoD ), National Aeronautic and Space Administration ( NASA ) and the National Oceanic and Atmospheric Administration ( NOAA ) that include a combination of systems that are dedicated solely to space weather as well as a few utilizing space weather sensors. Data from all of these sources combined, are continually pushed to the space weather operations center at the U.S. Air Force Weather Agency ( USAFWA ) here. With this information in hand, the Weather Squadron can produce the most reliable space weather forecast possible, however even with all of this data, producing a space weather forecast is still much more difficult than creating one for terrestrial weather. “Space weather is a terribly difficult science and it takes a lot of training and experience,” Colonel Jones said. It is also important to note that today the world is much more reliant on space-based assets than they were during the last Solar Maximum, officials said. With cellphones, portable navigation devices and satellite television receivers, all part of our daily lives, a huge solar weather event could wreak havoc on quite a few different platforms. “We already have members within the unit developing forecast techniques based on signatures we see on the sensors,” Sergeant Money said. So it’s a safe bet, that ‘the next 2-years’ will be ‘hectic’ for the 2nd Weather Squadron [ OWS ]. Their mission, to provide ‘situational awareness to key decision-makers’ will certainly keep ‘them’ busy. “About 1-year ago, it was not uncommon for an analyst to only have one ( 1 ) very small Solar Region of the Sun to monitor,” Sergeant Siebert said. “Today, it is normal for analysts to keep fairly busy monitoring 4 Solar Regions to 6 Solar Regions. Studies, of the last Solar Maximum, show that typically 1-day included twenty-two ( 22 ) active Solar Regions – almost 4 times our current workload,” he added. Regardless, Weather Squadron [ OWS ] ‘space weather’ analysts, forecasters and technicians globally are ready for the upcoming solar fury [ see, e.g. Solar Energetic Particle Event ], Colonel Jones said. A massive solar flare that erupted from the Sun late Tuesday ( March 6, 2012 ) is unleashing one of the most powerful solar storms in more than 5-years, ‘a solar tempest that may potentially interfere with satellites in orbit and power grids when it reaches Earth’. Several NASA spacecraft caught videos of the solar flare as it hurled a wave of solar plasma and charged particles, called a Coronal mass Ejection ( CME ), into space. The CME is not expected to hit Earth directly, but the cloud of charged particles could deliver a glancing blow to the planet. Early predictions estimate that the Coronal Mass Ejections ( CMEs ) will reach Earth tomorrow ( March 8, 2012 ) at 07:00 a.m. Eastern Standard Time ( EST ), with the ‘effects likely lasting for 24-hours and possibly lingering into Friday ( March 9, 2012 )’, Kunches said. The solar eruptions occurred late Tuesday night ( March 6, 2012 ) when the sun let loose two ( 2 ) huge X-Class solar flares that ‘ranked among the strongest type’ of sun storms. The biggest of those 2 flares registered as an X Class Category 5.4 solar flare geomagnetic storm on the space weather scale, making it ‘the strongest sun eruption so far this year’. Typically, Coronal Mass Ejections ( CMEs ) contain 10,000,000,000 billion tons of solar plasma and material, and the CME triggered by last night’s ( March 6, 2012 ) X-Class Category 5.4 solar flare is ‘the one’ that could disrupt satellite operations, Kunches said. “When the shock arrives, the expectation is for heightened geomagnetic storm activity and the potential for heightened solar radiation,” Kunches said. This heightened geomagnetic activity and increase in solar radiation could impact satellites in space and ‘power grids on the ground’. Some high-precision GPS ( Global Positioning Satellite ) users could also be affected, he said. Airplanes that fly over the polar caps could also experience communications issues during this time, and some commercial airliners have already taken precautionary actions, Kunches said. Powerful solar storms can also be hazardous to astronauts in space, and NOAA is working close with NASA’s Johnson Space Center to determine if the six ( 6 ) spacecraft residents of the International Space Station ( ISS ) need to take shelter in more protected areas of the orbiting laboratory, he added. The flurry of recent space weather events could also supercharge aurora displays ( also known as the Northern Lights and Southern Lights ) for sky-watchers at high latitudes. “Auroras are probably the treat that we get when the sun erupts,” Kunches said. Over the next couple days, Kunches estimates that brightened auroras could potentially be seen as far south as the southern Great Lakes region, provided the skies are clear. Yesterday’s ( March 6, 2012 ) solar flares erupted from the giant active sunspot AR1429, which spewed an earlier X Class Category 1.1 solar flare on Sunday ( March 4, 2012 ). The CME from that one ( 1 ) outburst mostly missed Earth, passing Earth by last night ( March 6, 2012 ) at around 11 p.m. EST, according to the Space Weather Prediction Center ( SWPC ), which is jointly managed by NOAA and the National Weather Service ( NWS ). This means that the planet ( Earth ) is ‘already experiencing heightened geomagnetic and radiation effects in-advance’ of the next oncoming ( March 8, 2012 thru March 9, 2012 ) Coronal Mass Ejection ( CME ). As the Sun rotates, ‘the AR1429 region is shifting closer to the central meridian of the solar disk where flares and associated Coronal Mass Ejections ( CMEs ) may ‘pack more a punch’ because ‘they are more directly pointed at Earth’. “The Sun is waking up at a time in the month when ‘Earth is coming into harms way’,” Spence said. “Think of these ‘CMEs somewhat like a bullet that is shot from the sun in more or less a straight line’. ‘When the sunspot is right in the middle of the sun’, something ‘launched from there is more or less directed right at Earth’. It’s kind of like how getting sideswiped by a car is different than ‘a head-on collision’. Even still, being ‘sideswiped by a big CME can be quite dramatic’.” Spence estimates that ‘sunspot region AR 1429 will rotate past the central meridian in about 1-week’. The sun’s activity ebbs and flows on an 11-year cycle. The sun is in the midst of Solar Maximum Cycle 24, and activity is expected to ramp up toward the height of the Solar Maximum in 2013.